Donate to the Protect Our Coast & Oceans Fund on your California tax form to support coastal and marine education and conservation! Learn more. Announcing the winners of the 2019 Coastal Art & Poetry Contest! Watch our Whale Tail® License Plate video, created by Radley Studios. Thank you to the many thousands of Coastal Cleanup Day 2018 volunteers! Read our Recap Report. Teachers: Explore and download the California Coastal Voices learning guide and online toolkit for middle and high school grades. Get a quantitative overview of the Public Education Program's impact. Learn how you can get a Whale Tail® Plate! In honor of World Oceans Day, 8,000 California students took part in the statewide Kids' Ocean Day Adopt-A-Beach cleanups at six events from Humboldt to San Diego. They learned about ocean pollution prevention at school and then took a field trip to enjoy a beach day, clean the coast, and form amazing art messages on the sand. 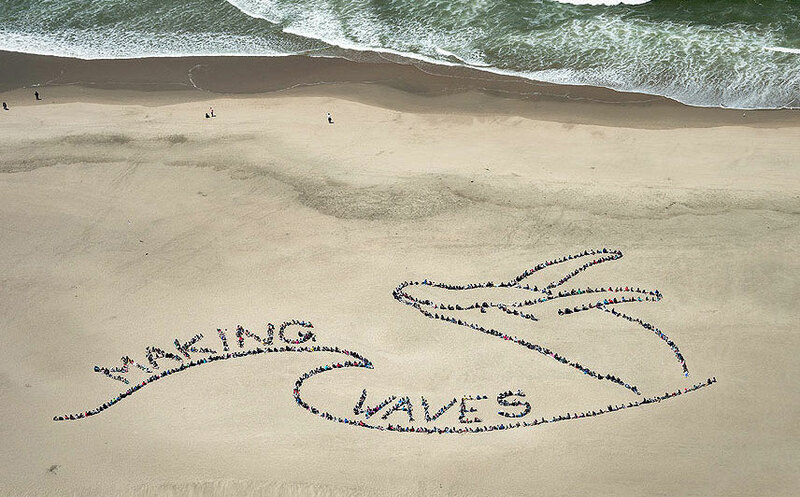 In 2018, the "Making Waves" theme demonstrated the children's power to raise awareness and make a difference about plastic pollution in the ocean. To see more images and learn more about this annual program funded by the WHALE TAIL® License Plate, visit OceanDay.net. In honor of World Oceans Day 2016, a short video was released to showcase nearly 20 years of aerial art formations as part of Kids' Ocean Day. We hope you enjoy the video.